Samhuinn is the final holiday that is connected to harvests in the Druidic Wheel of the Year, and this is a time of apples, pumpkins, hawthorn berries (haws), nannyberries, rose hips, and rowan berries. I always like to do some kind of magical crafting in relationship to the holidays, and this Samhuinn, I made a magical hawthorn tincture. I’m going to walk through the steps of making a tincture for healing and magical work. About Hawthorn: Hawthorn is a fantastic healing medicine for the heart in all its forms (physically, emotionally, and spiritually). It is also an incredibly sacred tree, with a rich history within the Celtic lands and throughout the world. Sometimes this tree is just called a “thorn” (such as the Glastonbury Thorn); the berries are called “haws.” It is also known as the thornapple tree. It has strong connections with the fairy realms and underworld work. Haws ready for tincture making! Seeking out the Hawthorn and on Magical Timing: I take hawthorn tincture each day; and I’ve been taking hawthorn tincture that a friend made me. I decided it was time to make my own magical hawthorn tincture and the right time to make it is on this glorious day! On Samhuinn eve, I spent the day with a friend visiting some local sacred sites in Michigan, including the Michigan Petroglyphs and White Rock. When we went to the Petroglyphs (which were closed for the season) we were greeted with a great many hawthorn trees. I found the right tree, left an apple as an offering, and gathered up many beautiful haws from the ground. On Samhuinn day, I was back home and set about making my tincture. 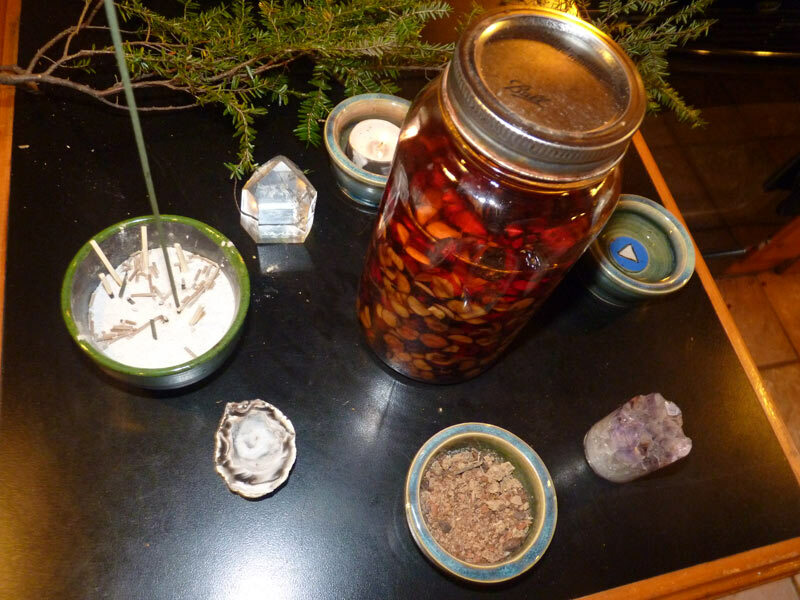 The timing of these was critical–I gathered the ingredients and completed the process during the height of the Samhuinn energies, so I am imbuing my tincture magically in that way. The broader principles here include finding a day or time of magical significance for gathering and/or preparation. I often will select events of astrological or astronomical significance, such as full moons, holidays, solstices, equinoxes, and the like so that I can add the energies of those days into the herbs. You can consider using the planetary day and hour to craft your tinctures as well. 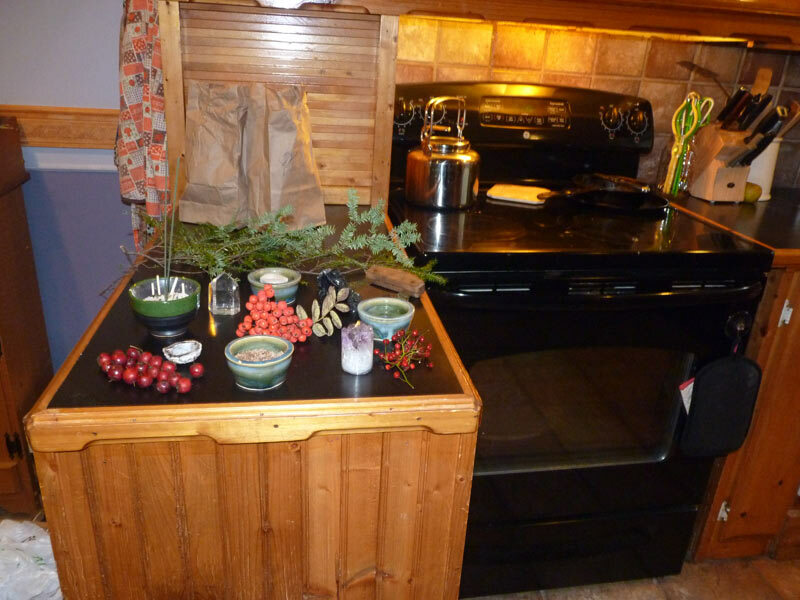 Opening a Magical Crafting Space: On Samhuinn day, I setup a little altar in my kitchen before beginning the magical crafting process. I generally use the AODA Solitary Grove openings and closings when I do my own work; I find these quite effective for magical crafting (as the Sphere of Protection, which is performed at the end of the grove opening calls in elemental energies and banishes negative/harmful imbalances of energy). I’ve been working these rituals for a long time, and while they take some time to learn (especially the Sphere of Protection) they are absolutely wonderful for magical crafting work–or any other work for that matter :). Regardless, to do the magical crafting work, you want to open up a grove of some kind with both the necessary clearing work and energy raising work–this keeps your space protected and energized. If you aren’t up for large ritual, even doing something as smudging the area, casting a circle, and invoking the elements will work. I also like to have a small altar for crafting setup (even if its temporary, like the one in my kitchen was) so that you have the elemental energies (or whatever other energies you work) present. Wash and inspect your ingredients for tincture making. 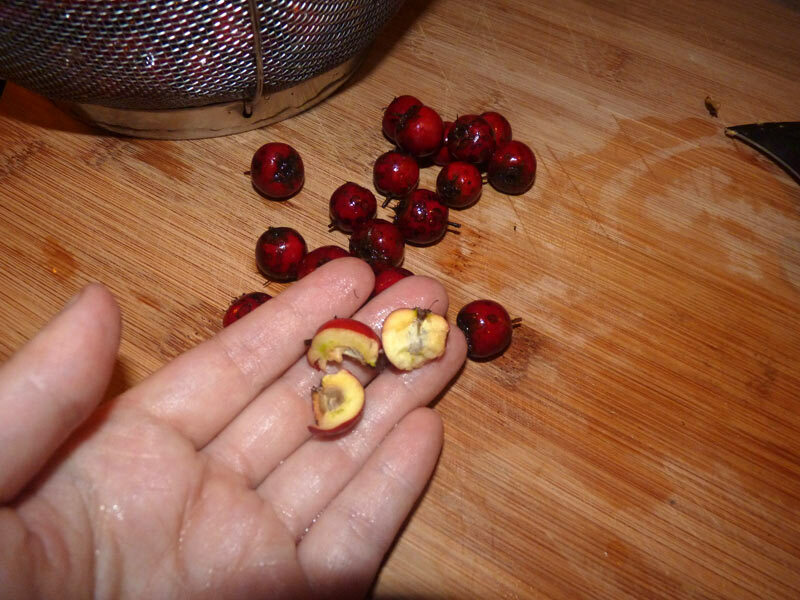 For a hawthorn tincture, the best ingredient would be fresh, blight-free berries. You can also make a very nice tincture with dried berries (in this case, just craft your tincture on an appropriate day for your work). 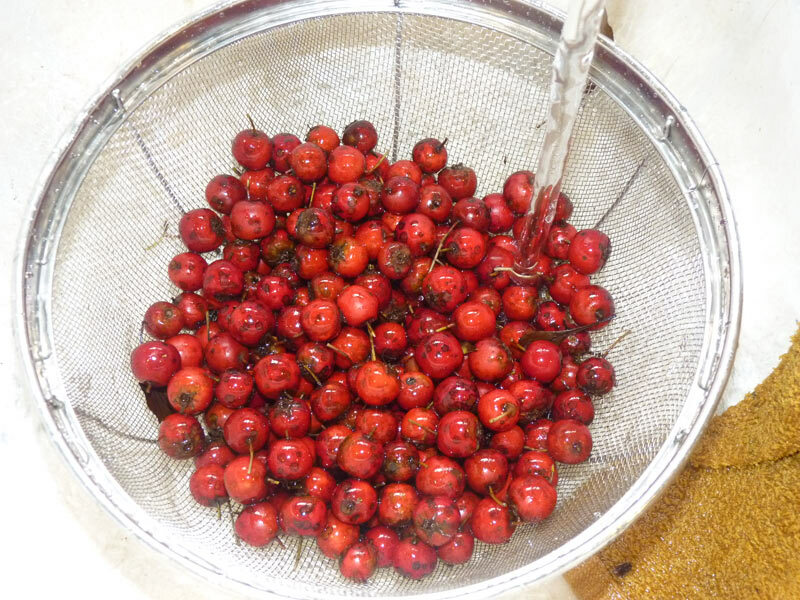 Here are my lovely haws being washed–I pulled out any berries that looked wilted, browned, or wormy. Prepare your plants/herbs. For either dried or fresh hawthorn (or any other herb), you want to crush up the herb as much as you can. This allows more alcohol to penetrate the herb and extract the herb’s healing qualities. For hawthorns that are fresh, I prefer to cut them up fresh. I really strongly encourage you to process your herbs by hand–you add your energies into the herbs as you do so. 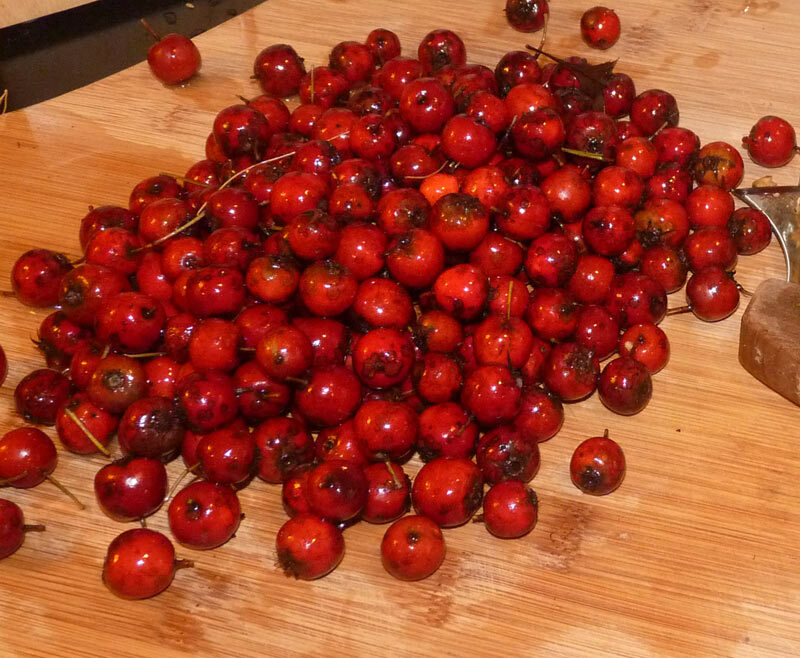 As I chopped up my haws, I focused on healing qualities and said a small chant as I did so. If you are using dried haws, you’d prepare them using a mortar and pestle. 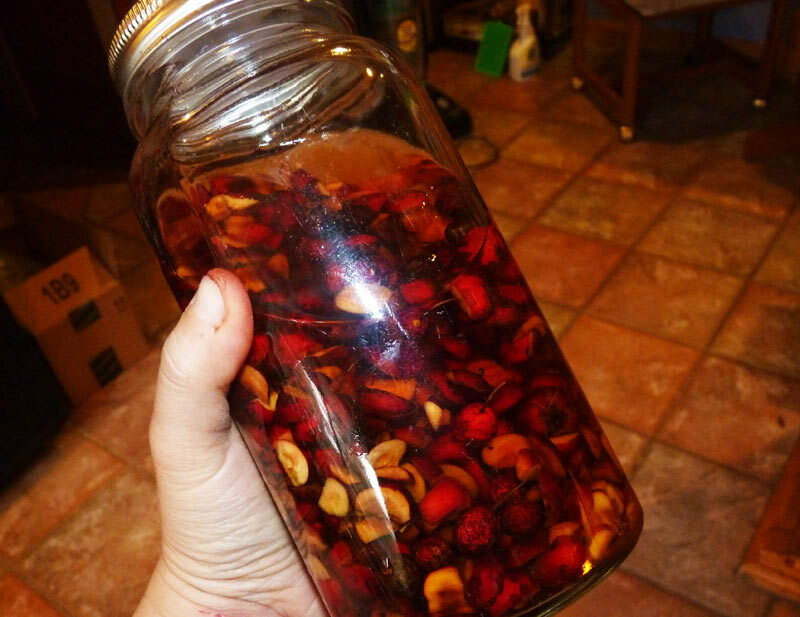 I actually used both fresh and dried in this recipe–I had gathered haws from Strawbale Studio before the trees were cut for the oil pipeline and also from an energetic line near here, and I wanted to add those haws into the tincture as well. Add Alcohol to Your Berries. Organic grain alcohol, if you can afford it, is a great choice. I don’t quite have those kinds of funds, so I’ve tried two kinds of alcohol for making tinctures — high proof Everclear (190 proof) and high proof vodka (160 proof). The Everclear produces a weird, strong taste, and I’ve found the Vodka to be more netural and allow the plant taste to come out more. I’ve used Devil’s Springs Vokda and I think its a good deal for the price. I usually buy it by the half gallon for tincture making. In terms of ratios, Cech suggests in Making Plant Medicine that tinctures should have the following ratios for fresh herbs: 2:1 and dried herbs 5:1. These are basic formulas that you can follow for most herbal tinctures–and loosely what I followed for my hawthorn tincture. 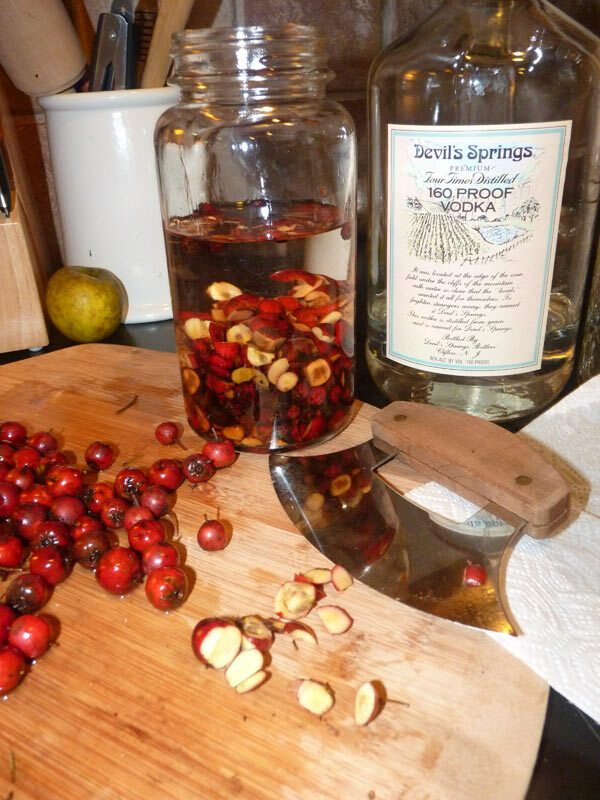 I added the alcohol and haws to a canning jar and sealed the lid tightly, then shook up the herbs. Magical Empowerment. At this stage in my crafting, I shift back to my altar and do some additional empowering work with the elements. I left my herbs sitting within the circle of the elements and stones for some time before closing my grove. A Period of Dormancy. Just like the land entering its cold and dark period, your magical hawthorn tincture needs a place of darkness to macerate. Find a place where the herbs won’t be in direct sunlight, but where you’ll remember to check them (I use my walk-in closet in my bedroom for this purpose, since I’m in there every day and its nice and dark). Once a day, shake up your herbs and continue to put that positive energy into them. Strain herbs and enjoy. After 4-6 weeks (or longer), you can strain your herbs out and use your tincture. I usually put it in a little amber bottle with a dropper and take drops as needed. Since this is a magical tincture, I will strain this tincture at one of the other holidays, most likely, the Winter Solstice/Alban Arthan. Taking Magical Herbal tinctures. Tinctures are typically meant to be taken orally; you can take 5-15 drops several times per day (check an herbal book, like Cech’s or Matthew Wood’s Earthwise herbals for specific dosages based on the herbal tincture you are making). You can carry them with you, use them for cooking, and so forth. I like to take my hawthorn tincture as part of my magical work for the day–I do a few different magical exercises each morning and evening, and I’ll take my hawthorn tincture both in the morning and in the evening as part of that sacred activity. I also will use very small amounts of it for other kinds of healing.